Select each category to view more information on how we fulfilled medal criteria. We registered and will be attending the Giant Jamboree in November. We validated our parts by showing that they work. We performed an ELISA Assay testing for properly folded insulin, and detected expression of Cytoplasmic Proinsulin, Cytoplasmic Winsulin, Ecotin Proinsulin and YncM Winsulin in the cell fractions we expected them to be. We also performed a glucose uptake assay to identify if the insulin and Winsulin we produced was functional. Multiple insulin-sensitive cell lines were tested for glycogen synthesis and glucose oxidation upon treatment with human insulin and with our insulin analogues. It was found that Ecotin-Proinsulin, Cytoplasmic-Proinsulin and YncM-Winsulin all induced an increase in glycogen synthesis and glucose oxidation, therefore are stimulating the insulin-receptor and functioned as we expected! We collaborated with many other iGEM teams in order to get where we are today. We helped the Sao Paulo State University team with their work, as they were also focusing on producing insulin. We helped them with data in Australia, and they in turn told us more about the Brazilian situation, as well as sharing knowledge on our Bacillus work and using the modelling program MatLab. We also communicated with Bristol University, and upon learning they had developed a tool for editing the iGEM wiki, we gave it a go and sent them our feedback. They returned the favour by providing us with data about insulin prices in England, which we were finding hard to come by! We worked with Cologne-Dusseldorf to contribute to their post-card distribution idea, by both producing a post-card and by distributing their postcards once they arrived. This collaboration worked both – we all helped one another by distribution each others’ project ideas to otherwise unreasonable parts of the world, a fantastic experience. We talked with Auckland University over skype multiple times, and were able to help each other with working on our wikis. We were also excited to host them at our University when a couple of their team members flew over to visit the SBA conference. We also worked with Chennai by exchanging protocols and tips for the lab. Finally, we worked with Uppsala by participating in their webinar series about the ethics of synthetic biology and intellectual property, which was a fantastic learning experience – both by us contribution our experiences and hearing what other teams from around the world had to say about our work. This work contributed significantly to how we approached our work; particularly with how intellectual property affects the ability of iGEM teams to contribute to the open source registry. As we were developing a therapeutic agent, there were various things that we needed to address to ensure that we delivered a safe, ethical, useful product for the world. On our Human Practices page we have discussed these issues and how they have impacted our project in its development. Furthermore, we went out to the general public to discover how close to home the issues we were learning about really are. This survey, though we only had a limited response, gave us great insight into the reality of diabetes treatment in the world. These results then made us reconsider our understanding of the Social Injustices caused by high priced medications. In our project it was very important to talk to multiple groups to gain a complete understanding of the issue of insulin accessibility: Type I diabetics dependent on insulin for health and survival, physicians prescribing the insulin, concerned citizens and members of organizations interested in helping those in need. Our integrated human practices can be broken into three categories: project design, applied design and entrepreneurship. Edwina Wang – a Type I diabetic alerted us of the importance of modelling our insulin in order to predict whether it will be short or long-acting. We found that our modelling predicted it would be short acting. Previous parts in the registry encoding ‘Human Inuslin’ were either incomplete or did not match human insulin when entered into a BLAST database. It seems as though there were few teams attempting to create human proinsulin (A, B and C-peptide chains) on a single vector, and so our addition of the complete verified human proinsulin coding sequence is an improvement on these previous parts. Furthermore, we have added an N-terminal His tag to our proinsulin constructs, allowing ease of purification using affinity chromatography. Our addition of an arginine residue between the His tag and the proinsulin protein allows simple one-step cleavage and removal of both the C-peptide and the His tag, as all have the same trypsin cleavage site (arginine residue). The addition of the Ecotin tag assists in the expression of proinsulin by inducing its transport to the periplasm, an oxidative environment with reduced proteases, ideal for folding proteins with disulphide bonds such as proinsulin. Furthermore, periplasmic expression allows for a simplified purification procedure, as only the periplasmic fraction is required. We have also used an extended ribosome binding site with high efficiency of recruitment, which is an improvement on parts entered that were only protein coding sequences. We created models of three types: experimental, physiological and economic. In the experimental model we wanted to examine the complexities of optimizing recombinant insulin production from microbes, so we examined the practicality of multiple expression systems. A model was produced that took into consideration the multiple energy costs within a cell, and examined the predicted success of multiple expression systems: cytoplasmic expression, periplasmic expression and secretion into the surrounding media. From this model we predicted periplasmic expression to produce the highest yield. This first model was based on the experimental work in the lab. We next produced another model that would predict the behavior of our recombinant insulin under human physiological conditions. From this model we predict that our insulin analogue Winsulin will be relatively fast acting compared to human insulin. Finally, we developed economic models examining the pricing of insulin across different markets. We performed an assay mimicking physiological conditions whereby cells were tested with the insulins we produced (that were previously confirmed via ELISA assay). We experimented on multiple cell lines, all of which were receptive to insulin, and measured their levels of glycogen synthesis and glucose oxidation after treatment. It was observed that when tested with Ecotin-Proinsulin, Cytoplasmic-Proinsulin and YncM-Winsulin all the cells showed more glycogen synthase and glucose oxidation activity than at basal levels with no insulin added. 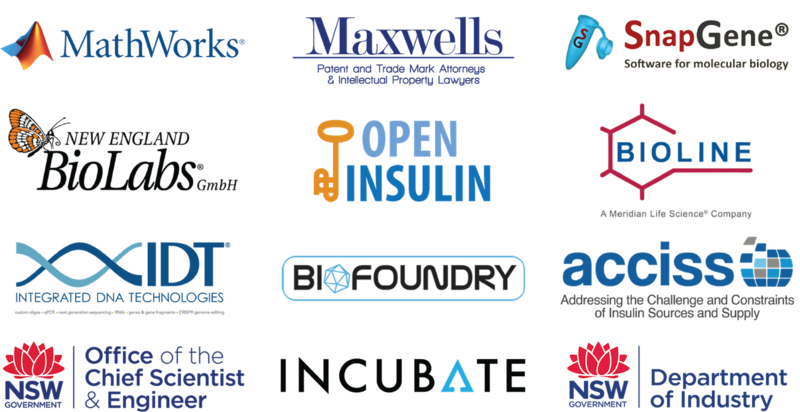 Since this mimics the role that insulin plays in the human body, we have demonstrated the functionality of our parts and the success of our project. Our team also is eligible for a number of special awards: for Integrated Human Practices, Education and Public Engagement, Model, Entrepreneurship and Applied Design. We utilized input that we received from online communities (insulin users) and professional advisors, to direct our project towards developing a regular Human Insulin due to its ubiquity on the global market, homology to the endogenously produced protein and freedom from intellectual property constraints. We listened to insulin users (via our survey, and communication with charity organisations involved in the distribution of insulin) who told us that ease of use and accessibility was important. From this we tried to include in our design of a novel analogue thermostability, an increased pI to result in maintenance of baseline blood glucose. We also used weekly meetings with the OpenInsulin team to educate ourselves on the realities of open-source production, and develop our potential plan for moving forward. When ReaGent (from Ghent, Belgium) integrated their views into the team we benefited from sharing global perspectives.